This utility works on any version of Windows, starting from Windows Vista, and up to Windows 10. Windows XP is not supported. In order to use PreviousFilesRecovery on 64-bit systems, you must download and use the 64-bit version of this tool. After choosing the desired options, click the 'Start' button to start the scanning process. Filename: The name of the file. Folder: The full path of the folder where the file is located. Older File Version: This item type means that an older version of existing file was found in a shadow copy. Current Modified Time: The modified date/time of the current file on your disk (Only for 'Older File Version' items'). Previous Modified Time: The modified date/time of the older file found in the shadow copy. Current File Size: The size of the current file on your disk (Only for 'Older File Version' items'). Previous File Size: The size of the older file version found in the shadow copy. Current File Attributes: The attributes of the current file on your disk (Only for 'Older File Version' items'). Previous File Attributes: The attributes of the older file version found in the shadow copy. Shadow Copy Time: The date/time that the shadow copy was created. 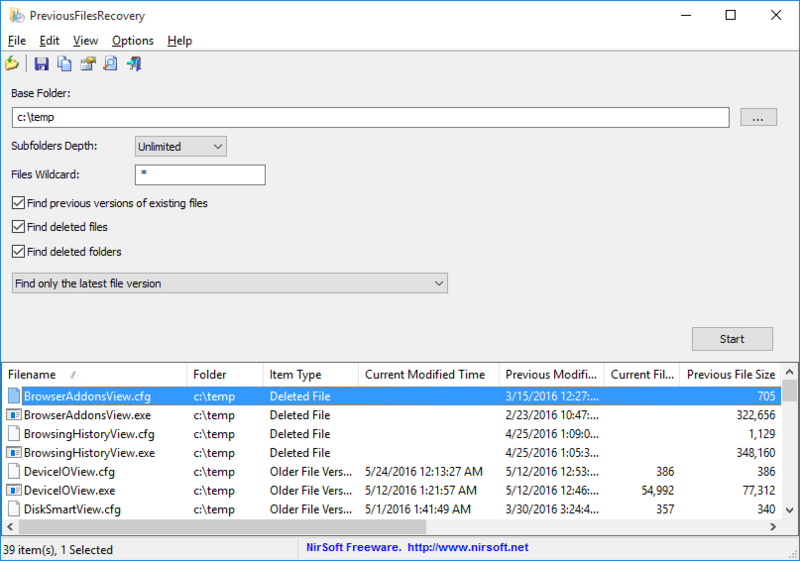 If you want to recover a file or folder that this tool found inside a shadow copy, simply select the files/folders you wish to recover and then press F8 ('Recover Selected Files/Folders'). In the 'Recover Files' dialog-box, type or choose the destination folder to copy the files and then click the 'Do it !' button. Be aware that if a file with the same name already exists in the destination folder, PreviousFilesRecovery will copy the file using another name. A file named PreviousFilesRecovery_lng.ini will be created in the folder of PreviousFilesRecovery utility. After you finish the translation, Run PreviousFilesRecovery, and all translated strings will be loaded from the language file. If you want to run PreviousFilesRecovery without the translation, simply rename the language file, or move it to another folder. PreviousFilesRecovery is also available in other languages. In order to change the language of PreviousFilesRecovery, download the appropriate language zip file, extract the 'previousfilesrecovery_lng.ini', and put it in the same folder that you Installed PreviousFilesRecovery utility.